Utah coach Larry Krystkowiak always says he wants his basketball teams to improve throughout the season. His continual emphasis of that subject has created something of a myth about his program. The Utes don't always get better, in terms of wins and losses. Judging by their two nine-game segments of the Pac-12 schedule, the Utes have posted an improved record in the second halves of four of Krystkowiak's previous seven conference seasons. The record shows an average bump of 0.42 wins in the second half of Pac-12 play, and only once has Utah made a significant move. In 2013-14, Krystkowiak’s third season — the sophomore years of Jordan Loveridge and Brandon Taylor and the junior year for Delon Wright as a junior college transfer — the Utes went from 3-6 to 6-3 in the second half, finishing one game out of a five-way tie for third place and winning a first-round game in the Pac-12 tournament as a No. 8 seed. Utah’s merely matching this season’s 5-4 record in the second half of league play would require improvement, because the schedule becomes more demanding. The Utes are done playing Stanford and California; those teams don’t come to the Huntsman Center in the scheduling rotation. Utah will face USC and UCLA twice each, starting Wednesday night against USC in Los Angeles. Actually, they played basketball, scrimmaging for about 40 minutes. That's what Krystkowiak believed his team needed, after two losses that stemmed mainly from too many turnovers. Analytically, the Utes rank No. 262 in defensive efficiency, according to kenpom.com. Anecdotally, they’re a decent defensive team when they’re playing well offensively, or at least not losing turnovers that the opponent converts into easy baskets. Points off turnovers can be a deceiving statistic, because not all turnovers lead to transition opportunities. Even so, Oregon scored 29 points after Utah's 20 turnovers and OSU produced 20 points after Utah's 10 first-half turnovers. The Utes lacked maturity and toughness last week, shrinking against Oregon's press and generally not being forceful with their passes. They also passed up some good shots to take worse ones, Krystkowiak said, partly explaining their four shot-clock violations against OSU. At both ends of the court, the Utes just need to make more plays — hitting shots, especially around the rim, and getting defensive stops, which also means rebounding the ball. “Everybody wants to try to find some cosmic answer to what’s wrong with the situation,” Krystkowiak said. He quoted former NFL coach Tony Dungy’s mantra of “doing the ordinary things extraordinary well,” and improving as a result. Tipoff: Wednesday, 9 p.m. MST. Records: Utah 11-10 (5-4 Pac-12); USC 13-9 (6-3 Pac-12). Series history: Utah leads, 22-19. Last meeting: USC 74, Utah 58 (2018). About the Utes: Utah went 3-1 on the road and 2-3 at home in the first half of the Pac-12 schedule. … Jayce Johnson is averaging 8.4 rebounds in Pac-12 games, ranking fifth in the league. … The Utes lost last season’s two meetings with USC by an average of 16.5 points. 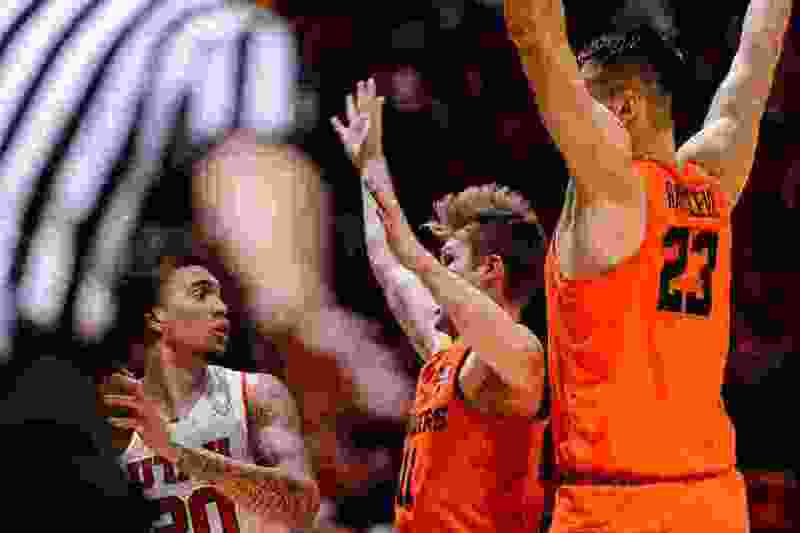 … Oregon State’s Tres Tinkle was named the Pac-12 Player of the Week, due largely to his 31-point day at Utah. … The Utes will remain in Los Angeles through Saturday afternoon, when they play UCLA. About the Trojans: USC’s only loss in the last five games came at Pac-12 leader Washington. … Bennie Boatwright averages 17.3 points and Nick Rakocevic, who recently won consecutive Pac-12 Player of the Week awards, averages 16.2 points and 9.9 rebounds. … The Trojans have won 12 of their last 13 conference games at the Galen Center. … “They’re really finding their way and they’ve got some real talent,” Arizona State coach Bobby Hurley said.